We believe that every student is teachable, and each student has their potential and value. Through love and care, their multiple intelligences and potential can be inspired. Taking the initiative from being loved to love, they may elaborate and extend the spirit of our school motto “Love Thy Neighbour As Thyself”. Adhering to the “love of education” and “family concept”, we emphasise that the school is our home. 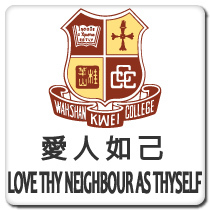 Kwei Wah Shan College is one big family with teachers, students, staff, and workers as its members. It is a family within which we learn mutual respect, appreciation, acceptance and tolerance. The teachers set an example to embody the spirit of ‘Love Thy Neighbour As Thyself’. We believe in building a loving environment within which the students will learn to love and care. O for a thousand tongues to sing in one great unison! Here we share, here we learn and learn the secrets of nation. And in favour with God and man, as written in scripture. Yearn not for fame, yearn not for gold, but to do what we can. Proud to be children of our Lord and pupils of Kwei Wah Shan.